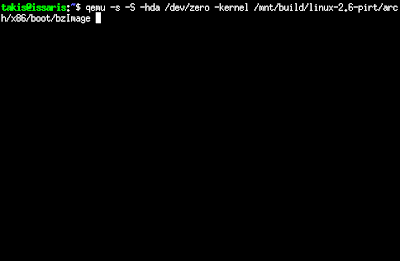 Then copy the provided kernel configuration into this directory giving it a new name ".config". 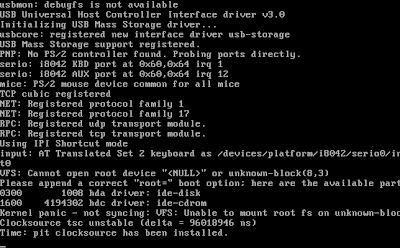 The following commands will then use this as a base-configuration to start from. Next, we'll configure the kernel. Just keep pressing enter to use the default answers to all the questions that the kernel configuration program will ask you. And enable the following options: In the "Kernel hacking" menu enable both "Compile the kernel with debug info" and "Compile the kernel with frame pointers". 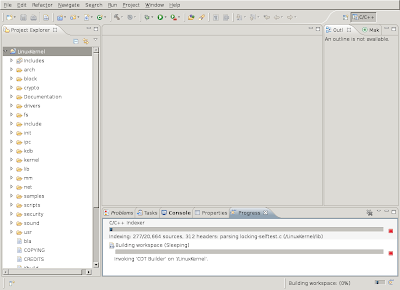 Now, we'll fire up Eclipse with the CDT plugin. You can download Eclipse with the CDT plugin from http://www.eclipse.org/downloads/. 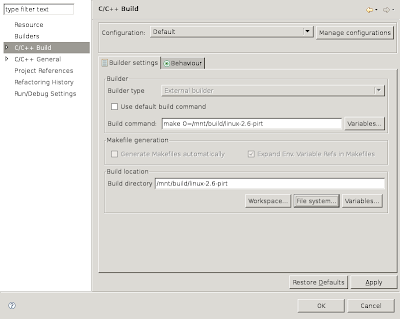 You'll need to download "Eclipse IDE for C/C++ Developers". Get rid of the intro screen. 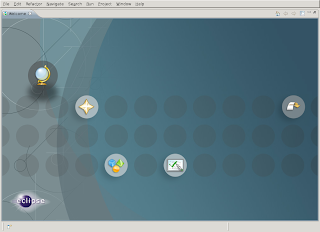 You'll get an empty workspace as shown in the screenshot. First disable automatic building, by using the "Window->Preferences" menu, selecting "General->Workspace" and deselecting "Build automatically". Eclipse will perform a time consuming indexing operation which you can disable by using the "Window->Preferences" menu, selecting "C/C++->Indexer" and switching from "Fast C/C++ Indexer" to "No Indexer". 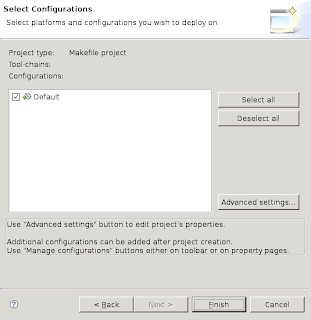 Then select "C Project", "Makefile project", "Empty Project". 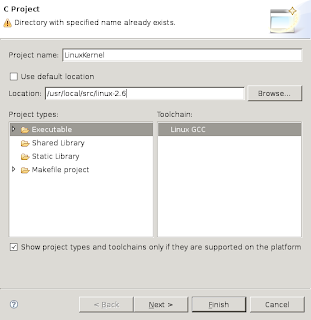 Now enter a project name and specify a specific directory for the project sourcecode. To do this, first uncheck the "Use default location" checkbox. 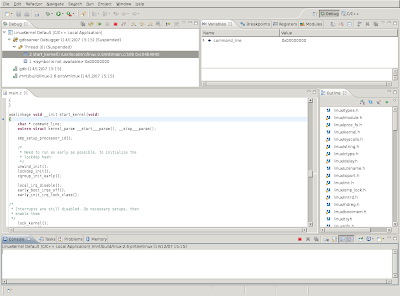 If you hadn't disabled indexing, Eclipse will now start indexing the Linux kernel sourcecode. This will take a long time. You'll see a progressbar which might give you an indication on how long it might take to complete. Eclipse finished indexing the kernel sourcecode. Now, we're ready to configure our debugger. Right-click on the project-name in the left pane (Project explorer) and select "Properties". 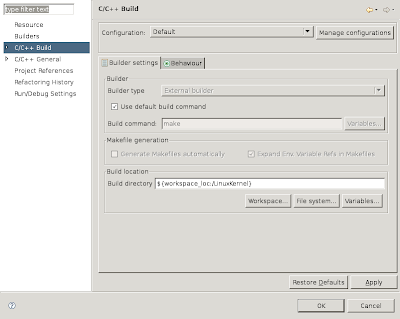 We want to modify the default build command and the location where the build files should go. Through the menu-bar select "Project->Build all" or press "Ctrl-b". After some time the Linux kernel build will be completed and you see "bzImage is ready" appear in the Eclipse Console output. Next, we'll run our kernel binary using the Qemu system emulator. 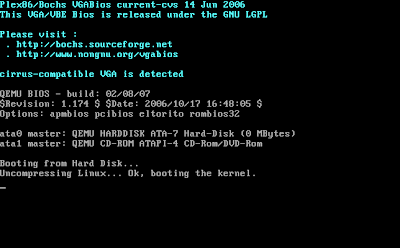 The nice thing about Qemu is that besides the normal virtual HD, floppy and ISO image booting, it can also boot Linux kernels directly. 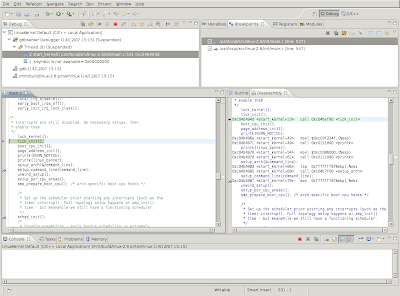 And, Qemu provides a GDB-stub to which we can connect from our Eclipse debugger. The "-s" switch activates this GDB-stub. The "-S" switch makes sure Qemu doesn't start running before we're ready (it freezes the CPU at startup). Because the CPU is "frozen" at startup, the Qemu window won't show anything useful yet. 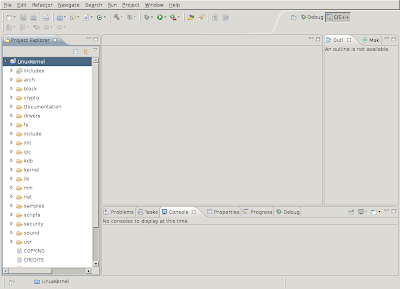 Click on the "Debugger" tab, and in the "Debugger" listbox select the "gdbserver Debugger". Next, modify the "Stop on startup at:" to "start_kernel". 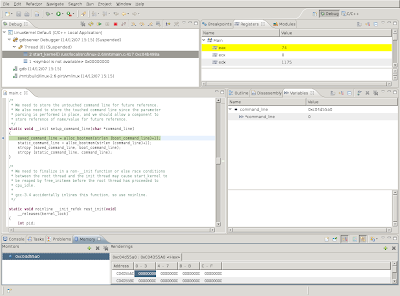 Below this, you'll notice a frame named "Debugger Options"; click the "Connection" tab in this frame and modify the "Type" to "TCP" and the "Port number" to 1234. Continue by clicking the "Debug" button. 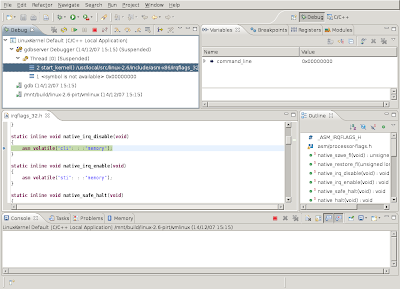 Eclipse might compile and link a bit, but will finally launch the debugger and ask if you want to switch to the debugging perspective. Say yes. 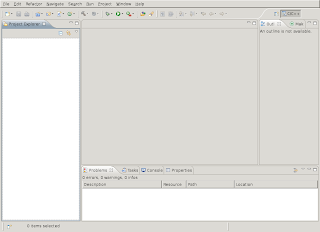 The next screenshot shows the debugging perspective. Just like with normal applications, you'll see that the line it is about the execute is highlighted. In the Qemu window, you'll notice some output already. This is the output which happened in functions preceding the start_kernel() function. By using "Run->Step over" or pressing the "F6" key, you can execute the kernel code line by line and examine what's happening. If you want to see the assembly instructions which are being executed, you can add a view which displays this by selecting "Windows->Show View->Disassembly". 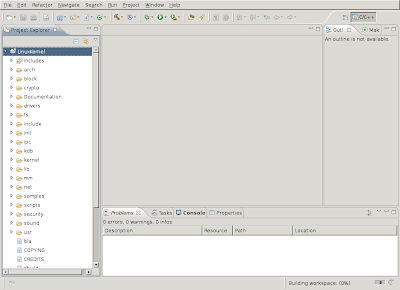 There's a register view too, as can be seen in the next screenshot. Registers who's contents has been altered by the previous execution step are highlighted in yellow. You can add breakpoints, inspect variables, inspect memory and much more, but as you keep running the kernel you'll run in trouble as we did not specify a true harddisk image for Qemu. So, you'll get the following output in the Qemu window, because the Linux kernel could not find a root filesystem on our fake harddisk image "/dev/zero". This is great :-) Thanks. * Your screenshots show /mnt/.../linux-2.6-pirt but the text doesn't have -pirt on it. That was a bit confusing for me. * You use /dev/zero as a hard disk image for qemu. It would be nice to have a reference on how to set that up. Do you know how I would debug a Linux kernel that's running inside a VMWare VM from a Mac OSX? I can compile the kernel bzImage in eclplise with CDT now. But I got a problem after I fired up the qemu. 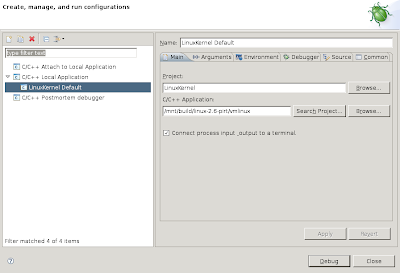 You mentined double-click the "C/C++ Application" in the dialog of "Debug Configuations" can shows the configuration of new debugger in the right side of the dialog. But after following your steps, it came up with a error message "Program no specified" but nothing in the right side of dialog. Did I miss any configure before?? Java ran out of memory indexing the source 20 minutes in. 4GB on the laptop, maybe there is some way to tell eclipse to use a larger java heap? BUt i am having a problem. 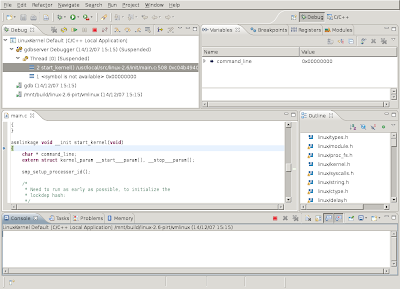 I am using eclipse helios. 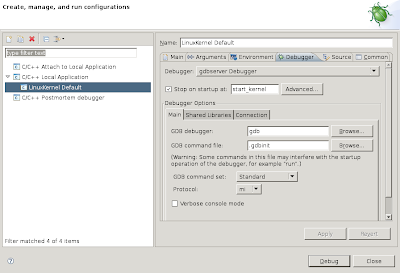 And in debug configurations it is not showing listbox at all for selecting gdbserver and also there is no connections tab. My debugging is taking ages so I thought there might be problem with debug configuration settings. Would you please help me out? If I run ARM linux on QEMU, can I debug ARM Linux using eclipse on x86 computer? Really excellent blog! How about a follow up regarding how to let the kernel continue running in the emulator? The above links is the snapshot of error.